Tux forms the divide between the Tux Voralpen (clay-slate mountains) and the main range of the Tux Alps (granite-like gneiss). The mighty Tux glacier rises up towards the sky at the end of the valley and peaks in the Olperer - at 3476m above sea level, the the highest peak in the valley. The varied geological structure of the mountains on either side on the valley enhances the beauty of Tux and its surroundings and is equally appreciated by the mountain hiking enthusiastics and Alpine specialists. 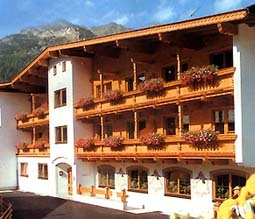 Our hotel is located in the heart of Hintertux. The Ziller Valley glacier lifts are a mere 800m away, and it’s only 50 metres to the nearest bus stop.